Led Zeppelin to reunite for Glastonbury 2010? 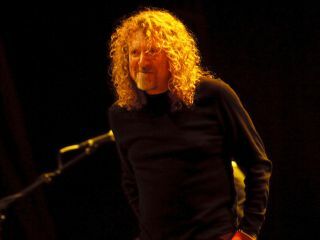 Led Zeppelin fans still hoping for one more reunion of the famed megagroup may have a glimmer of hope by the confirmation that singer Robert Plant is considering a slot at next year's Glastonbury festival. Since the band last reunited at London's O2 Arena in December 2007, talk of a full-fledged reunion tour has dogged Plant, Page and John Paul Jones (John Bonham's son Jason manned the kit at that show). And for a while, the band members, minus Plant, seemed gung-ho, rehearsing and even going so far as to audition replacement singers when it became apparent that Plant, enjoying considerable success with his collaboration with Alison Krauss, wasn't down for the endeavor. Alter Bridge's Myles Kennedy seemed to have the inside track for the gig, but after that fell through, Page's manager, Peter Mensch, in an exclusive interview with MusicRadar, proclaimed "Led Zeppelin are over!" Now Plant says he's been talking to Glastonbury festival boss Michael Eavis, and in an interview with the BBC, when asked who he'd be playing with, the singer remarked, "There's a place for me, but I have no idea who with." Of course, timing could again be a problem, as John Paul Jones looks to be quite busy for the forseeable future with his brand-new supergroup, Them Crooked Vultures.